I posted previously about this issue. Recent issues have arisen. A Pohutukawa situated on the domain is not in a good way. The officers had identified this and obtained an arborist’s report which described the tree’s plight. The future does not look good. Approximately one third of the root system on the southern side of the tree has been exposed by recent coastal erosion. The erosion has also undermined approximately 50% of the tree’s root plate. The significant loss of anchoring roots on the windward side of the tree and the undermining of the root plate has resulted in a substantial loss of the trees ability to stabilise itself under wind loading. This is also likely to result in die back of the tree’s canopy, which will be correlated with the amount of root loss. Staff made an operational decision for health and safety reasons to cut the tree to the stump. It posed a risk to nearby power lines and other infrastructure. When the Waitakere Ranges Local Board learned of community concerns about the tree we asked for it to be discussed at the public meeting next Tuesday. The local board has a history of advocating for and acting to protect trees since its inception. We regard this as an important obligation and an important part of local environmental protection. Issues about the tree have occurred at a time when the future of the Huia Sea Wall is being discussed. 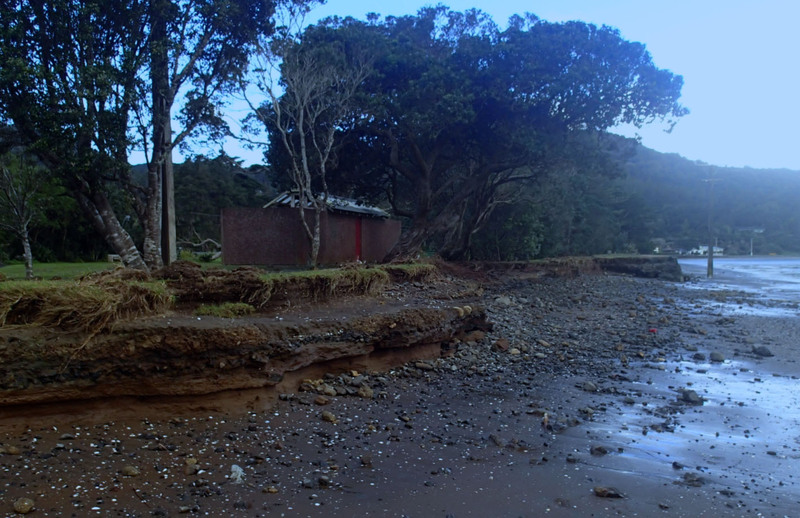 There has been some suggestion that cutting the tree to the stump is part of a decision to allow managed retreat approach to the failed sea wall at Huia. This is not the case and no decision on the future of the Huia seawall has been made. And how did the trees roots become to be in this situation ? Well we all know that the local board had the rocks removed that were in front of the tree and protected the tree and the shoreline from the sea. Why did the Council remove the rocks? Hi Peter I have no idea. This had nothing to do with the local board and I was not even aware that they were being moved. I will find out and let you know. Hi greg. Yes the board is involved as Denise Yates apparently approved the removal after consultation with Grant Jennings I believe. Ive just read http://www.stuff.co.nz/auckland/67664119/Protesters-gather-to-save-Auckland-pohutukawa-tree as reported today. Grant Jennings failed to advise the reporter here that the erosion was caused by Council removing the rocks that protected the shoreline (about 5 months ago). All the locals looked on wide eyed when we were told at the 1st Public meeting that the rocks were removed to save the shore ! DOH. Council caused this issue. JUST PUT THE ROCKS BACK and save the tree, save the shoreline. Save the domain. As a longtime local of 37 years in Huia, and like many folk who live there, we are directly connected to the sea and the land. And we love living there. We love it when townies come out and share our special time-warp place. Its not just locals who will miss out on a great park at the Huia Domain – its all of Auckland. Huia Domain gets packed out with families….why does the board want to get rid of it. Why dont the board honour the District Plan recommendations that we all agreed on ? That the seawall needs urgent repair and enhancement. I can categorically state that Denise had nothing to do with the decision to remove the rocks. And the last thing the Board wants to see is the loss of any open space. Strange thing was the Park Ranger was also surprised to see workmen about to enter the domain and start their chainsaws. There are several issues that need addressing about what is and is not true. The removal of rocks placed into the car park that was stopping erosion while decisions were being made. This has increased the speed of erosion. The general consensus of Huia community is they want the cheaper rebuild of the seawall than the more expensive loss of 55% domain to the sea. Denise Yates didn’t help your cause when she said at a public meeting “it is your own fault for buying a house below sea level” Of course there is “NO Issue” unless the seawall is removed. The issue of what was going to happen to the toilet and changing rooms was not thought out. One of your fellow board members had the audacity to suggest that came out of different funding. Surfice to say only one lot of funding is available to the Auckland City Council and that is “Rate Payer” even money given by the Crown to Auckland needs comes from rate payers of Auckland thru taxation. What you and your board are doing is not in my opinion democratic and needs to stop forthwith! Thanks for your comments Paul. I have spoken to officers and there is no way that they would allow the road to be undermined. Residential houses are safe. The local board was as surprised as the park ranger at what happened. I see that the removal of the rocks is a significant issue. As I said above this was not a board decision. Who sped up the instruction to treescape to come and attempt to carry out work ahead of schedule and before the scheduled meeting next week when its on the agenda — both councillors deny any involvement – but officials were adamant that was where the direction came from – I can here it now Agenda item – tree – what should we do now its been cut down …….. lets consider our options ? At what point will we the ratepayers and local community be given any real say in the decision making processes – or do we have to wait three years to vote in a new group of councillors to decide what our community facilities should look like!! No dodging. I did not even know that the rocks were removed until today. I understand the staff made a decision to do this and it was on the basis that there was scouring of the bank happening even with the rocks in place. I received some emails about the tree and officer’s belief that it should be felled. I and other board members asked for more information. We received the arborist report last Thursday. We have not been able to respond and did not sanction the decision to send Treescape out. I do not know what discussions have been had with the original contractor but there is a limitation period (six years) that applies and if Council is out of time this will pose problems. The Board has exactly the amount of power that the super city legislation gives it. I hear you about powers and responsibilities. If it was up to me Waitakere City would still exist and have full power over these sorts of decisions. As it is the local board has input into park’s decisions, it has roughly $640k in the budget for repairs to the wall and if a new wall is to be constructed then Council will need to be approached for the money. With regards to the toilet block there is money for its maintenance and at some stage its renewal. The money has been in the budget for some time. Next Tuesday by all means come along to the meeting and have your say. I have just seen a post on HuiaSOS’s facebook page from Sandra Coney to confirm that the rocks were removed from the shore as they were causing erosion. DOH. and ya took the rocks away. What protection then does clay and topsoil have agin the sea during a storm. Sandra’ Coneys post confirms that I have stated facts previously. The lunatics have now taken control of the asylum. Put the rocks back. Replace the clay and topsoil that has been eroded by the idiotic act. Why is the board bent on destroying our Domain. Man if we dont fix this my future grandchildren will ask me why did I let this Domain disappear. The seawall protects the shoreline which is where it exists today and since time immemorial. No one can disagree with that. its a fact. Dear Greg There are some outrageous claims on your blog.